Your Body Needs Fat: Learn why. Real fat. Saturated fat. Cholesterol. Yep, your body needs it. If you missed yesterday’s post about where the ridiculous fat-phobia came from, hop on over and take a good read. Today’s post is dedicated to all the reasons your body needs fat. What kind of fats do we need? For thousands of years our ancestors knew that fat was special. They didn’t have terms like “calories,” “unsaturated,” or “per gram” in their vocabulary. But they did know that fat filled them up. They knew that they could eat fat and feel satisfied. More importantly, they knew that it provided them with health, vitality, and energy. The body needs an abundant supply of the fat-soluble vitamins and fat-soluble activators that are only found in animal fats. In fact, all of those good-intentioned veggies that you put on your plate should be eaten with fat to help with vitamin and mineral absorption. (Yeah, carrots and butter are better than just plain ole’ carrots.) Similarly, protein can’t be assimilated without fat either. In fact, a study of over 1,700 Swedish men showed that consumption of fruits and veggies was associated with a lower risk of heart disease, but only when combined with full-fat dairy consumption (2). But aren’t these loaded with saturated fat? Isn’t that bad? Real fat is good fat. So I’m going to say it again: Your body NEEDS fat. Guess what? 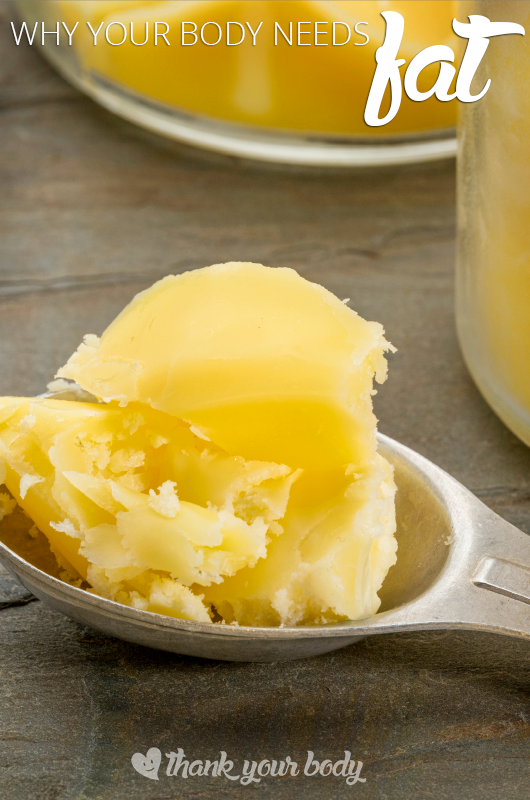 Saturated fat is real fat, which means you body needs that kind of fat, too. It is also essential. Saturated fat contains lauric acid—a beneficial fatty acid. Not only has it been shown to increase your HDL good cholesterol levels significantly, but it is also lacking in most Americans diet and has even been shown to have some powerful immune-boosting effects. It is even being studied currently in HIV/AIDS research to help improve immune function in patients (5). Researchers are also discovering that saturated fats can actually prevent heart disease (6). Did you know that there are several well known tribes in Africa… the Masai, Samburu, and Fulani tribes… where their diet consists mostly of raw (unpasteurized) whole milk, lots of red meat, and cows blood? The typical members of these tribes eat 5x the average amount of saturated fat compared to overweight, disease-ridden Americans. Despite their very high saturated fat intake, they display extremely low body fat levels, and heart disease and diabetes to natives of the tribe is virtually non-existent (7). Huzzah! Fat is good! Let’s go wild! Sure your body needs fat, but before you get too excited and bust out the Oreos, keep in mind that there are some bad fats out there. Really bad fats. The real problem is fake or artificial fats. The kind of fats that get altered for various reasons—like hydrogenated trans fat that were created to prolong shelf life of other fake and processed foods. Our “new-fangled” fats like all hydrogenated oils, soy, corn and safflower oils, cottonseed oil, and canola oil are very problematic. These fats are heated to very high temperatures in processing (or when frying or cooking) and have been shown to cause cancer, heart disease, immune system dysfunction, sterility, learning disabilities, growth problems and osteoporosis. These fake fats are definitely doing their part in our obesity and disease epidemic (8). With all this information it’s easy to feel overwhelmed, especially if you start reading labels (because fake fats are in so many processed foods–even the “healthy” stuff like salad dressings). I don’t think this information is meant to convince people that they need to be like the Masai and eat only red meat and cows blood. My family does eat meat, but sparingly. I also think that it’s possible to live a healthy lifestyle on a Vegetarian diet (as long as you include a lot of high quality dairy and eggs). I personally don’t think a Vegan diet makes sense from a purely healthy perspective (although I have plenty of Vegan friends who are awesome and I’m sure would disagree). They ate real fats. High quality fats. They didn’t eat processed food. No wrappers. No barcodes. They didn’t eat animal products pumped full of hormones, antibiotics, or diseased from inhumane practices. They recognized that food was nourishment. They recognized the importance of food in shaping future generations. I hope you will see the importance of fat and of all the macro and micro-nutrients (in other words, don’t go replacing a low-fat diet with a low-carb one). Seeking out nutrient-dense foods is imperative for our children and our children’s children. 3. Shanahan, Dr. Catherine. Deep Nutrition: Why your genes need traditional food, 2008.